Phagocytic immune response. 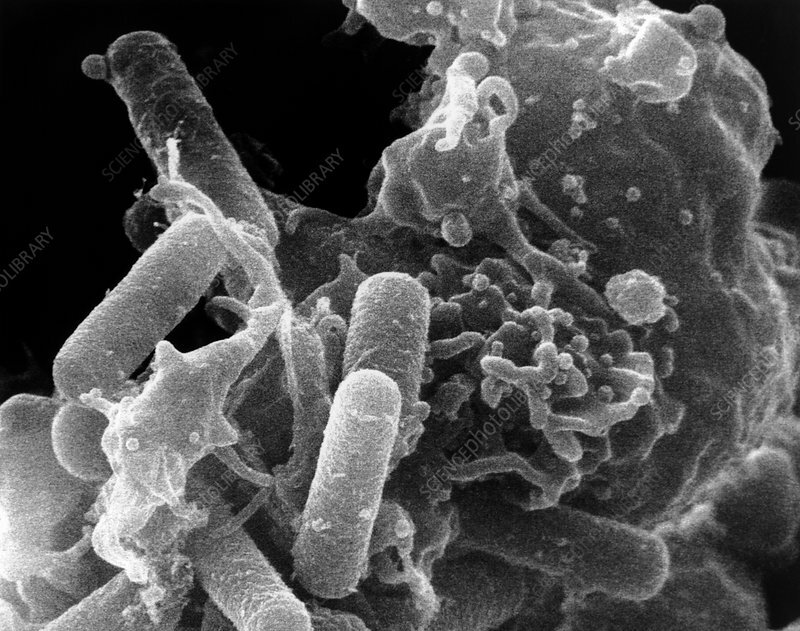 Scanning electron micrograph of a polymorphonuclear white blood cell (leucocyte) attacking Bacillus cereus bacteria. The polymorphonuclear leucocyte or neutrophil is attaching to and engulfing the Bacillus cells (large, rod-shaped at left). The leucocyte will then use enzymes to digest the bacteria. This process of engulfment and digestion is known as phagocytosis. Highly mobile, phagocytic cells migrate to areas of tissue damage. However, their necessary enzymes are quickly depleted by phagocytic activity so they degenerate. Defunct cells accumulate in pus. Magnification x25,000 at 10x8 inch size.